The Musashino Kikai Film Casting allows to make a film. Film casting process includes extrusion, orientation, winding for resin from T die. For film casting of the breathable film Musashino Kikai have very best market share. They made the film that allows air to pass through but blocks the water to pass through. Now it is used for rain wear and diapers etc. There is a combination technology of bonding multiple films closely and technology of printing in the same line. Both orientation process and printing process in serial production line are available. There are two test machines for film casting with orientation unit and thickness meter. 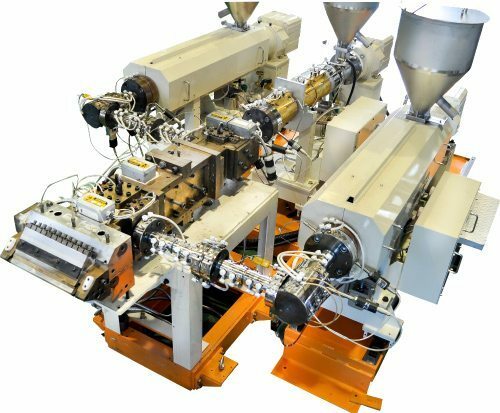 The test unit 1 equips with extrusion for 3 kinds 5 layer, air knife, air chamber, vacuum chamber, rubber nip roll etc; many types of film casting method are OK. Screw analysis is also available. We realized multi-layer film such as 3 kinds 5 layers and 3 kinds 3 layers adding Φ40mm Φ50mm extruders besides an existing Φ65mm extruder. Data such as temperature controllers is centrally managed with touch panel display and each setting data can be printed at real time. (After the test it can be provided by a media). The test unit allows to manufacture film of up to 1000 layers and to pile thin films that have many functions with excellent orientation technology. Super multi layer film leads to avoid lowering film strength and lead to better forming characteristic.